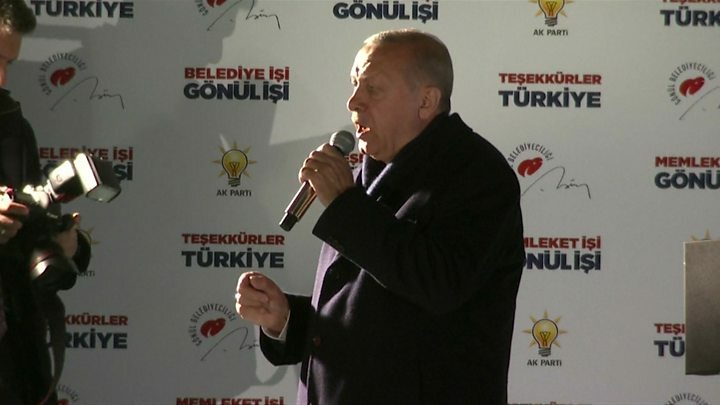 The party of Turkey’s President Recep Tayyip Erdogan has lost control of the capital, Ankara, in local elections, in a blow to his 16-year rule. But the president’s AKP party is challenging the result in both cities. The elections, considered a verdict on Mr Erdogan’s rule, have been taking place during an economic downturn. The AKP – or Justice and Development Party – alleges “invalid votes and irregularities in most of the 12,158 polling stations in Ankara”. 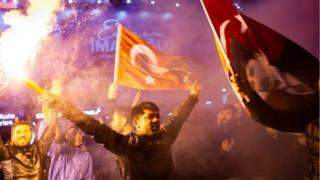 The AKP says it will also challenge the result in Istanbul – the largest city – and the eastern province of Igdir. Commenting on the results in a speech on Sunday, Mr Erdogan looked ahead to national elections in 2023: “We have a long period ahead where we will carry out economic reforms without compromising on the rules of the free-market economy. The opposition Republican People’s Party (CHP) candidate Mansur Yavas won in Ankara, officials said. With almost all votes counted, he was on nearly 51% and the AKP’s Mehmet Ozhaseki had won the support of just over 47%. Both CHP and the AKP claim victory in Istanbul, which has been in the hands of parties linked to Mr Erdogan since 1994, when he was elected the city’s mayor. The election commission said the CHP’s Ekrem Imamoglu was leading there by less than 0.5%, but that the results of more than 80 ballot boxes were being challenged. Results carried by Anadolu put the margin even narrower, at less than 0.25%. “The people have voted in favour of democracy. They have chosen democracy,” CHP leader Kemal Kilicdaroglu said. President Erdogan had painted this election as a matter of survival. He’s now been dealt an agonising blow. For the first time in a quarter of a century, his party has lost Ankara. And in the economic powerhouse of Istanbul, there’s a hair’s breadth between the governing AK Party and the opposition. As the official tally showed fewer than 3,000 votes between them in this city of 18 million, both said they’d won. But then the count stopped, with more than 1% of ballot boxes still unopened: a tactic, says the opposition, to steal victory. This could be a watershed moment for Turkey’s powerful, polarising president: when an opposition long seen as moribund finally feels he’s beatable. Mr Erdogan, whose two-month campaign included 100 rallies, said the poll was about the “survival” of the country and his party.